The Augrabies Falls National park is renowned for its scenic attractions and abundance of wildlife. Although this park is known mainly for its scenic attractions, viz, the Augrabies Falls, you will get the chance to see some game here. The birding, particularly along the river, is excellent and there is a good chance of seeing Springbok, Gemsbok and Black rhino.The local blue-headed lizard is fascinating and can often be spotted sunning itself on the rocks. The park's vegetation is fascinating, with a huge array of succulent plants, including the interesting, tree aloe (Aloe dichotoma) which goes by the common name of quiver tree, or kokerboom. The Nama people lived in the area for centuries and managed to adapt to its harsh conditions. 'Aukoerebies' is a Khoi name for 'the place of the Great Noise', referring to the Orange River, which thunders its way downwards for 60 metres in a spectacular waterfall.The region is famous for its traditional domed huts called 'matjieshuise' (mat houses). The huts are perfect for summer and winter season. In summer, the stems and culms from which the mats are made shrink allowing gaps to appear, thus cooling the huts and in winter the stems expand to prevent cold winds and rain.The ancestors of modern history had developed weapons for hunting animals like Hippopotamus. Some of the creative archeological features are the stone cairns or grave from the later Stone Age. Excavation reveals that not all the cairns have human remains.Such names as Moon Rock, Ararat and Echo Corner describe this picturesque and rocky region, characterised by the 18 kilometre deep abyss of the Orange River Gorge and craggy outcrops dominating the scrub-dotted plains. The 28 000 hectares on both the northern and southern sides of the Orange River provide a sanctuary to a diverse species, from the very smallest succulents, birds and reptiles to Springbok, Gemsbok and the endangered Black Rhino.The Slender Mongoose, Yellow Mongoose and Rock Dassies make up the wildlife that has adopted to the harsh conditions of this region. Aloe Dichotoma or Kokerboom is the most distinctive plant in the Augrabies Falls National Park. Bushmen or San people used the soft branches of this giant plant to make quivers for their arrows and that is how it got its name, Kokerboom.Another interesting animal found in Augrabies is the Cape clawless Otter. Its presence in the Park has much to do with the healthy ecosystem of the Orange river. Some of the predators in Augrabies include the Leopard, Black Backed Jackal, Caracal, the Bat-eared Fox, and the African Wild Cat.Black Stork and Black Eagle are both bred in the park. The Augrabies Falls National Park is also home to the Pygmy Falcon, Pale Chanting Goshawk, Rosyfaced Lovebird, Namaqua and Blackchested Prinia. There is also an isolated western population of Doublebanded Sandgrouse in addition to the more common Namaqua Sandgrouse. 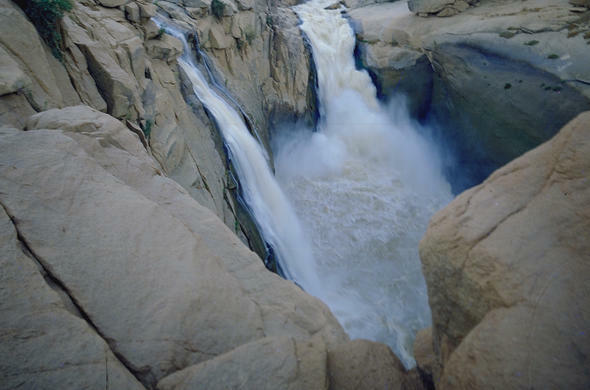 The main attraction is the spectacular Augrabies Falls. The park offers night drives during peak periods. Interesting activities include the Gariep 3-in1 trail, a short paddle, hike and mountain bike ride, and the 3 day Klipspringer Trail hike.Augrabies Falls National Park's game drives allow you a rare opportunity to enjoy a close view of the Springbok, Klipspringer, Black Stork and Falcon. Or you can just listen to the thundering sound of the magnificent waterfalls. Guests can also enjoy a picnic or braai (barbacue) in the park or a taste of the appetizing dishes from the park's restaurant. There is also a ladies bar. Augrabies is the largest conservation area within the Orange River Nama Karoo vegetation type. The park stretches for 18 200 hectares and has a flactuating temperature ranging from low to high levels. From January to April you can expect a rainy season at Augrabies. March to October are the most pleasant months in the park. The park is about an eight hour drive from Cape Town and ten hours from Johannesburg. The nearest airport is Upington.